In case anyone feels too proud of our exceptional children and innovative teaching methods, a letter by Anne Hooper to Henry Bullinger might be the good dose of humility and the kick in the pants we need. 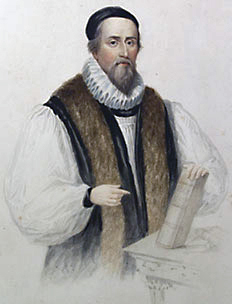 Anne wrote this letter from London in 1551, while her husband John Hooper (pictured here) was in prison. As godfather of the Hoopers’ four-year old Rachel, Henry Bullinger was concerned about the young girl’s upbringing and asked Anne to give him some news. Four year old?!? Within three months? I am sure Rachel was a bright little girl, but she also had parents and a church family who believed her young mind could retain much more than weary old brains, and who knew what type of instruction counted most. Kris Moberly on Happy Birthday Augustine!